Hi all just a quick reminder in this cold weather. You might not be in mood for entering into the garden, however if you’re the proud owner of a greenhouse i would recommend it, Why? you might ask. Well certainly for those in the east who are encountering the most snow fall at present they will find that a certain amount is building up on the roof of your greenhouse. At first glance it may seem harmless; however it might be worth noting that potentially it could do more damage than you might think. For example, the weight of freshly fallen snow is approximately 100 – 150 kg / cubic meters. And once it has fallen on a solid surface the effect of compaction due to its own weight the wind and other additional factors rapidly increases the weight of the snow. To put it in context if the roof of your greenhouse had a surface area of 16m squared, and we received 50mm of snow which is about two inches, you would have .9 of a cubic meter of snow on your roof. This equates to approximately 80 – 100kgs. If this snow freezes the weight on the roof increases. 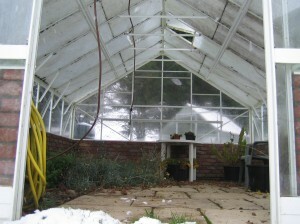 Depending on the model of greenhouse that you own, it’s worth noting this may affect the structure of the greenhouse. 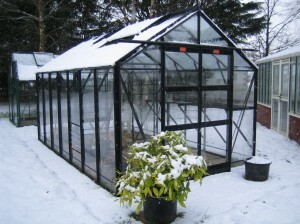 To avoid any damage or the possibility of a complete collapse of the greenhouse I would recommend that you clear it of snow as it builds up. Please note that this is perfect excuse for going out to throw snow balls, so thankfully it’s not all bad news. 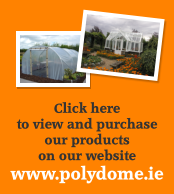 « Polytunnels & Frost Protection.